The Bobbilicious Files: Old dog - New trick! Check it out - I'm DPNing! I have always been fascinated by the technique but so scared of the little needles sticking out all over. But while I was reading some blogs I found this pattern and decided to give it a try. So far, so good! It's not as bad as I had thought it would be. The needles have only slipped out of the stitches about ten times, but no stitches have dropped except the one on purpose. 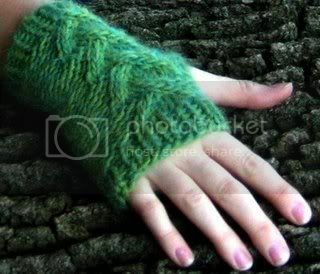 It's a cute fingerless glove. The pattern is at http://pixieriot.blogspot.com. She says she's working on a sweater with the same stitch pattern - ribbing and dropped stitches. Sounds good! What else is new? Teachers gifts. My friend Jenny gave me the idea of making apple dishcloths. I have two teachers, so I'm giving each one an apple and a red, white, and blue one. I only have one more apple to make, and the teachers are done. I'm making some dishcloths for my friend Jerri's birthday, too. Her sons are in the military - one is in Iraq and the other one is home from Iraq - so I found some military dishcloth patterns. I'll be making her an Army, a Marine, and a red, white, and blue. The only other gift I'm working on is a lap blanket for my dad. He's been cold alot lately, which is unusual for him - he was always hot. Of course, he's been very unwell, so that's probably why his temperature is off. I have some very chunky Red Heart that I won on ebay. It will be a nice-sized lap blanket for when he naps in his chair. The yarn is pretty fun - it's neon rainbow, not very dad-like, but warm and rather soft and washable. I want it to be easy care for mom's benefit. She still works and doesn't really have time to hand wash. Can't say that I don't understand! I'm a new knitter and haven't tried dpns yet. I just got some though for a bag I'm making. Haven't gotten to the part where you use them yet though. Thanks! Unfortunately, I have to wait until after the holidays until I can start something for myself! ..oops... or fingerless glove! lol. My bad.